Description: Each case contains 8 small bowls of Malt-O-Meal® Frosted Flakes and 8 small bowls of Malt-O-Meal® Coco Roos® Cereal. 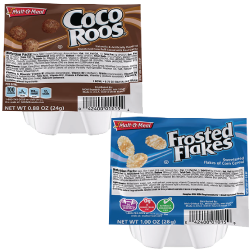 Frosted Flakes bowls contain 28 grams of cereal; Coco Roos bowls contain 24 grams of cereal. Ingredients: Frosted Flakes: Milled corn, sugar, contain 2% or less of: salt, malt extract, corn syrup, wheat starch . Contains wheat. Also contains corn. Coco Roos: Sugar, whole grain oat flour (includes the oat bran), corn syrup, modified corn starch, Cocoa (pressed with alkali), Coconut oil and/or Canola oil and/or partially hydrogenated soybean oil, salt, natural and artificial flavor, wheat starch. Contains wheat, soy and coconut. Also contains corn.